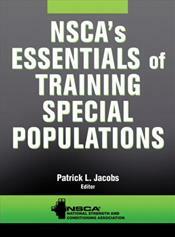 NSCA's Essentials of Training Special Populations is an indispensable text for aspiring and established exercise professionals working with special populations such as children, aging adults, and clients with temporary or permanent physical or cognitive conditions and disorders.Clients with special conditions often require modifications to general exercise recommendations, specific exercise facility design, and particular training equipment. This text will help exercise professionals design customized programs for clients with these unique considerations. ... The text discusses the benefits of exercise for special populations and the exercise-related challenges they often face. This is followed by a review of the pathology and pathophysiology of numerous conditions and disorders. Tables listing exercise recommendations for specific conditions are presented, complete with training modifications, precautions, and contraindications, as well as commonly prescribed medications and their potential effects on exercise responses and adaptations.